Want the newest boots in the field? Need new wellingtons for the Winter? Technically we may still be in ‘summer’ but we at Philip Morris & Son have finalised what’s filling our shelves this Autumn & Winter meaning we can give you fresh info on what’s hot for footwear in the upcoming season. Autumn/Winter 2016 sees the rebirth of footwear from Musto, with over 50 years of experience in producing the very best products for our market we are certain these new boots will follow suit. We at Philip Morris & Son were delighted to test some prototypes last year and we’re sure they’re going to be a big success. Up first we have the Brampton Boot which is available in both a pull-on and side zip style. Musto have put a lot of thought into the design of this boot, and have invested so much faith that they are having every single one handmade, to ensure each and every boot fulfils the precise requirements of their experienced maker’s eyes. 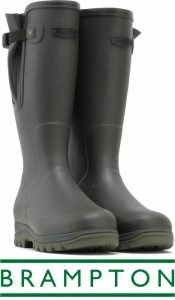 The Bramptons are made of 100% vulcanised rubber; vulcanisation being a process where natural rubber is combined with sulphur to increase its durability, it also acts against natural rubber’s tendency to be affected by the temperature, deforming in heat and becoming brittle in the cold, thus meaning the boots can be worn all year round. Musto’s Brampton Boots are made with 60% natural rubber, this vulcanised rubber has then been paired with a 3mm neoprene lining, for the added warmth and insulation which neoprene provides. (For more information about boot linings be sure to check out this post.) If you opt for the zip side style you’ll be pleased to know that even this detail has been considered at great length; the zip is a water resistant vislon zip, made by the world’s top zip manufacturers YKK, it won’t rust and is far lighter than a standard metal zip, and really does live up to YKK’s slogan of “little parts, big difference”. Now we move on to the Storm Gore-Tex Boot. The boot is constructed from two types of Gore-Tex friendly leather which is double layered in a two tone style to maintain the boot’s shape throughout its front profile. 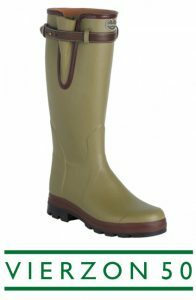 The 100% leather upper provides you with that welcome feeling of luxury and quality and the Gore-Tex membrane which lines the boot means your feet will stay completely dry from the wet of the field and from your own perspiration. Again these boots have been invested with YKK zips which in this boot is accompanied by a leather lined waterproof gusset for extra protection. An interesting feature of these boots is the removable shock absorbing footbed, which is leather lined, meaning when needed you have extra support against a rough or moving terrain. Pairing this footbed is a vibram outsole which gives you much needed traction for your terrain. 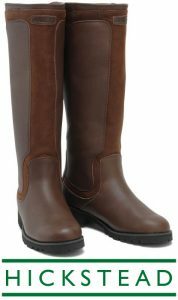 The Hicksteads are definitely one for the country lady, available in both brown and black leather the attractive Gore-Tex boots are carried in sizes 4 – 8 with half sizes available. 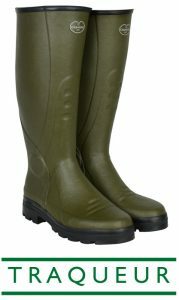 Getting these wellies on is a simple task as hidden away inside the boot is a finger loop to enable the pull on style without detracting from the overall look of the boot. In addition the boots have been designed with a wide entry giving you an easy fit. 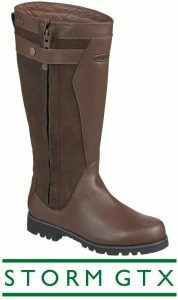 With a Gore-Tex membrane the Hicksteads are waterproof and breathable. The boot is tapered at the calf for comfort and the double layered leather maintains the boot shape, again including the removable leather-lined shock absorbing footbed. Fresh from Barbour are wellingtons that truly reflect the company’s well established country wear roots, as well as a brand new stylistic choice. 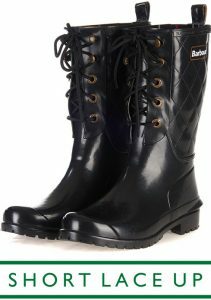 Here we have the ladies Barbour Blyth. The Blyth is a slim leg welly, which provides you with a more feminine feel that you may not achieve in cheaper alternatives. The Olive outer is paired with Barbour’s classic tartan lining to create a classic country look. Made of the vulcanised structure we discussed earlier the boot is durable and includes leather detail on the top line and strap. The Barbour branded heel kick off aids with taking the boots off and the commando style outsole provides strength. Well look at these ladies! Brand new for 2016 is a new blend of wellington and lace-up boot: the short lace-up welly. Whilst providing a fresh new aesthetic to the more traditional boots, quality has not been compromised. 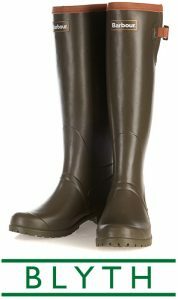 The wellington is made of highly durable vulcanised rubber. The Barbour branded boot features a high gloss finish which would be perfect for festival season and the quilted exterior is calling out to be paired with a quilted Barbour jacket. The Cyclones are a neoprene lined full zip performance boot. 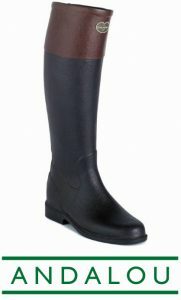 Along the top of the durable rubber boot is an attractive leather topline. The zip is fastened by a Barbour branded metal adjuster meaning your able to achieve your desired fit.Very similar in name to the Cyclone is the Barbour Hurricane which is a pull-up cotton lined performance boot. If making a decision between the two it’s worth considering how much insulation you require and whether you need the zipped version for easier entry and exit. AW16 for Le Chameau brings focus to all of our country and equestrian needs and also a fitting celebratory piece for this well established brand. New to the market this season is the Andalou, an equestrian style country boot. Featuring a stylish turn-up in a contrasting colour the boots are easy to put on and have a water repellent zip. 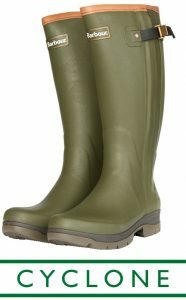 The overall look of the boots would make them perfect for any country setting such as country walks with the dog. The jersey lining is comfortable and dries quickly. Next up we have the Traqueur, a Hunter tracker boot designed with Beaters and Keepers in mind. The boots are light for long days in the field and the Kevlar reinforcement is beneficial when in coarse landscapes to protect against abrasion, Le Chameau’s newly created ‘onsteam’ lines this boot meaning your leg and foot temperature is regulated efficiently. Zipping up this boot is the watertight ‘aquazip’ which is situated at the rear for both convenience and discretion from the profile view of the boots. We are delighted to be launching the Traqueur boots in collaboration with Le Chameau at all major Country Shows this summer. Last but certainly not least is the special edition Le Chameau Vierzon 50. Designed to celebrate the 50th anniversary of the vierzon boot the Vierzon 50 sees the iconic boot revamped from its iconic 1965 heritage, a process which saw the addition of a stylish full-grain leather tightening strap around the top as well as saddle stitching and the introduction of the anti-allergy onsteam lining. These beauties have been produced in a limited number, so be sure to add these to your basket quick sticks! So there you have it, an introduction to new footwear products we will be stocking for Autumn and Winter 2016. Be sure to visit our website to check out these and other products and if you ever need assistance please do get in touch. Autumn/Winter, Autumn/Winter 16, AW16, barbour, Country Clothing, country footwear, GORE-TEX, hereford, Le Chameau, Musto, Neoprene, New Season, Philip Morris & Son, Shooting Season, vislon, YKK. Bookmark.